Our cancellation policy is One month prior to date of arrival or you will be charged 100% of the first nights accommodation. If there is a reduction in numbers this must be done 2 weeks prior to day of arrival to avoid charges. All Weekends 2 nights stay. Bank Holidays require a stay of 3 nights minimum. Barnacles Temple Bar House fait route avec Hostelworld depuis plus de 10 ans et il n'est pas trop difficile de comprendre pourquoi. Leur personnel Â«supersympa, serviable et accueillantÂ» "travaille dur" "et en fait toujours plus pour le client. Il est souvent évalué par nos clients comme l'un des meilleurs éléments de l'auberge, dans le centre de la zone animée de Temple Bar. Leur reception est ouverte 24/24 et cette sécurité signifie que vous êtes sûr de pouvoir profiter des Â«visites guidées gratuites Barnacles Â» ainsi que des pubs. Nous aimons que vous puissiez aller au bureau de poste à temps, le personnel peut aussi poster vos cartes postales pour vous! 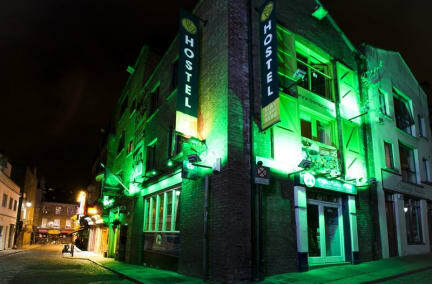 The most popular hostel in Dublin! … all by hostelworld cutomers like you! To quote the 2012 Lonely Planet: 'Bright and spacious, in the heart of Temple Bar, this hostel is immaculately clean, has nice laid-out ensuite dorms and doubles with in-room storage. Because of its location, rooms are quieter to the back. Top facilities, comfy lounge and linen and towels provided'. Every room comes with an ensuite bathroom and is centrally heated. Our cosy rooms have hot showers, comfy mattresses and individual reading lights to ensure you have a good rest. Each bed has a built-in under-bed locker to secure your luggage, and all rooms have electronic security card access keys. All the dorms are cleaned daily and the beds made with fresh linen. Our housekeeping team are permanent and professional staff who care about what they do were committed to being the cleanest hostel in Dublin. We can make your stay easier, from having the basic for hire like hair dryers, adaptors and alarm clocks to doing your laundry and cooking you dinner. Here you’ll find all the facilities you need, like our free light breakfast, free Internet access and Wi-Fi, the fully-equipped kitchen, laundry service, bureau de change, recycling, tour ticket desk (open 8-10) and more. We also make it easy for you to meet other travellers, with a selection of chill-out areas and a variety of group activities on offer. Make sure to go on our Barnacles Pub Crawl, daily at 21.00 – valid for 2 nights in the row. There’s no curfew, so you’ll have lots of time to explore the pubs and bars of Temple Bar. And if you want to stay in, you can hang out in our newly refurbished lounge, where we have a huge DVD collection, a foosball table and lots of good cheer. There’s also a book swap, darts and featured movie nights and popcorn. We also periodically organize gigs in the hostel! Were in the perfect location, in the heart of Dublin’s cultural quarter - Temple Bar. You can enjoy a pint of Guinness in the famous Temple Bar pub, only two doors away. When you stay here you’ll only be a minutes walk from everywhere else cafes, pubs, transport, internet cafes, supermarkets, convenience stores, banks, the post office and so much more. Not to mention tourist sites like Trinity College, Dublin Castle, the Old Jameson Distillery, Christchurch Cathedral and more! Conveniently, there’s bicycle storage on the premises and parking (with a discounted rate) only two minutes walk away. Our staff are young, helpful and friendly, as well as knowledgeable on what’s on and what to do in and around Dublin just ask! We can help you reserve car hire and we offer discounts on hop-on/hop-off city tour tickets and the airport shuttle, leaving direct from our door. Reception is open 24hrs a day so there’s always someone on hand to help. If you need access to our secure room, its accessible 24hrs a day and is available for luggage and valuables. Safety deposit boxes are also available. We have special weekly rates available including laundry, breakfast, Wi-Fi and internet. For more information ask at reception. To make life easier for you, we have arranged discounts in many top venues, restaurants and activity centres in Dublin, giving you often over 20% discount on normal rates! Yes, drinks as well! Heading to Galway as well? Check out our sister hostel, Barnacles Hostel Galway, here on Hostelworld! Très bien situé. Cependant n'oubliez pas les bouchons d oreilles. Bon séjour à cette auberge. Très bien située dans Dublin. Nous avons dormi deux nuits dans un dortoir mixte de 6 personnes. Petite pièce pour autant de personnes. Cependant, la salle de bain est adaptée au niveau de la taille et est très propre. Perfect location right near Temple Bar. Staff was very friendly and helpful. You can attend to different events which is very cool! The room however was a little bit tiny and the bathroom also. Perfect for one or 2 nights. Trop bruyant, ambiance froide, douche qui fuit. Je ne recommande pas. La traduction suivante est une traduction automatique effectuée par Emplacement, emplacement, emplacement! Il ya pas de meilleure auberge de jeunesse situé à Dublin, en plein cœur du hip Temple Bar, le centre de divertissement de Dublin. Lorsque à Dublin, Temple Bar est le meilleur endroit pour découvrir la culture irlandaise, une variété de pubs et boîtes de nuit ainsi que des restaurants et des attractions culturelles. Avec une grande valeur et de la sécurité que nous fournissons également: le petit déjeuner GRATUIT marche Visite gratuite de Dublin wifi GRATUIT, GRATUIT draps, de 15 minutes à internet gratuit et de réductions dans de nombreux pubs et clubs. Nous sommes particulièrement fiers des grands compliments et impressionnants avis du personnel nous continuons à obtenir - les gens qui travaillent ici fab nous distinguent du reste.